With its reputation for zero carbon, everything has a local flavour on the stunning Somme Bay. Enjoy its food and festivals and seek out our secret spots. We seem to spend our lives on the road these days so it’s always refreshing to find a special place for a short break where you can just park up and forget about the car entirely. Enter Saint Valery sur Somme, a pretty French village on the coast of Northern France, only 75 minutes by car from Eurotunnel or the Calais car-ferry. There’s so much to do all in one place (a boat or kayak trip to see the seals, a stroll in the quaint lanes of fishermen’s cottages, a bike-ride, a mooch in the typically French market…) that you’ll wonder why you didn’t know about it already. The serene seascape is breath-taking so you might be tempted to come for the nature-watch opportunities alone. But if you don’t also go town-wards and off the beaten track, you’ll be missing a trick... or five. lly –shuttered terraced cottages burst in flower, some bearing the names of their first inhabitants in tiles above the door. There’s a secluded spot where fishermen’s wives and children used to keep a lookout for returning boats and pray for their loved ones’ safe return. To find this special place to visit, with its monument and tiny wooden chapel, head to the Calvaire des Marins. Cobbled streets of rust brick or half-timbered townhouses characterise this walled part of town. 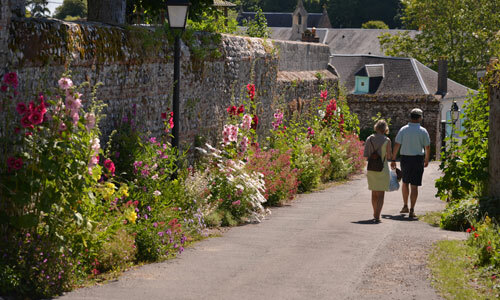 The pretty French village streets and lanes are so quiet and so unspoilt, you leave with a warmly nostalgic sense of what Saint Valery would have been like in days gone by. The Chapel de Saint Valery is undisputedly the locals’ number one magical place - and picnic spot too. Although it’s only a 10 minute walk from town, the sense of isolation and the view over the bay give it a tranquil and spiritual quality. From the chapel, take the track towards the bay to reach the beach. There’s a single café right on the sand - La Buvette. A speciality you won’t see much further afield is the Gateau Battu, a brioche-type delicacy traditionally given to friends and family on special occasions. Our locals recommend you couple it with rhubarb jam or a Picardy cider for added indulgence! Buy one from the hipster Watterlot pâtisserie or from the Fournée de la Baie bakery – they also sell more pains than you can shake a baguette at! Explore the community food scene at the Sunday market; so much produce is locally-sourced, it’s like opening the door of the local larder. It starts at Place des Pilotes and extends right along the promenade. All is not lost if you’re not here on a Sunday: head to the store named La Sardine on Rue de la Ferté. Anne France will talk you through (in English!) 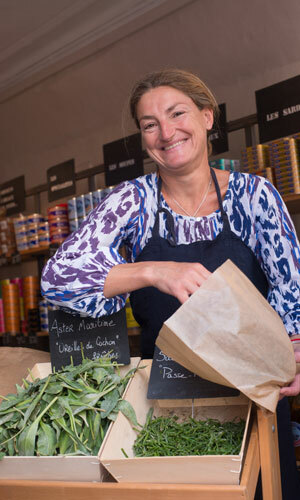 her passion for Somme Bay zero-carbon products; why not try the samphire or the Oreilles de Cochon - not pigs’ ears as the translation might suggest but a spinach-like plant and local speciality that local chefs use to flavour their dishes. Anne France will also be delighted to share her tips on how best to explore the bay. Best restaurants in Saint Valery sur Somme to taste local cuisine and savoir-faire specialities. What’s on the menu? This region is now called Hauts de France but locals are still so proud to be from Picardy – its former name – that references to it aren’t going anywhere anytime soon. Take the Ficelle Picarde for example, a delicious crêpe dish made with ham, mushrooms and cream or the Paté Picard on the menu at the waterfront Relais de Guillaume de Normandy restaurant; it’s made with salicornes (samphire) hand-harvested on local shores. Moules-Bouchot is another speciality to look out for in Saint Valery - mussels grown on wooden poles in the sea. Wherever you go, fresh and seasonal is the order of the day whether it’s Coquilles Saint Jacques scallops or locally reared salt-marsh lamb. For savoir-faire at its best, connoisseurs head up to the exquisite Tables des Corderies restaurant where the creative chef is a committed ‘locavore’: he only uses locally-sourced produce. Recommended to us by one of our special places to stay, you’ll also find fish restaurant Le Mathurin where the catch du jour dictates the dishes. It’s a family affair with chef Pierre-Alain Delaby’s nearest and dearest all on the sidelines: his parents are both local fish traders, his mother was his culinary mentor and his brother supplies the catch from his own vessel. If their concept of boat-to-plate isn’t the epitome of super-fresh and locally-sourced, we don’t know what is! Le Balcon en B - Contemplate modern objets d’art over a beautiful breakfast at this B&B which has the feel of a Parisian creative’s apartment. Alain and Clothilde can either welcome you for table d’hôte evening meal (on reservation) or share their ‘bonnes adresses’ restaurant recommendations. Cottages la Croix de l’Abbé - You’ll be hard-pushed to find a friendlier welcome than Christine and Gilbert’s. Offering gîte accommodation in the former stables, plus a stylish and comfortable chambre d’hôte (B&B), they’ve thought of everything to make this special place to stay all the more memorable: you can even borrow their bikes to explore the area. Gilbert is Saint Valery born-and-bred so local knowledge knows no bounds! For coffee - There are many cafés on the promenade yet locals convene for coffee at Bar de la Civette on Rue de la Ferté. For a dip - It’s too dangerous to swim in Saint Valery sur Somme on account of the shifting sands so head to Cayeux sur Mer instead. For festival fun - Annual event fixtures include the Festival of Theatre in June, the Fête de la Mer in August and the Christmas Market in December. For brocante - If browsing for all things vintage and retro is your thing, you should also look out for local Réderie markets – it’s a local word for a fleamarket.